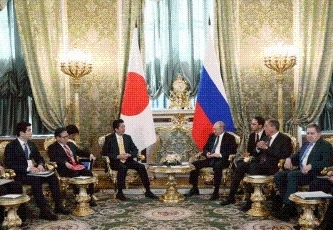 On May 26, for approximately 2 hours and 45 minutes, Mr. Shinzo Abe, Prime Minister of Japan, held his 21st Japan-Russia Summit Meeting with H.E. Mr. Vladimir Vladimirovich Putin, President of the Russian Federation (a small group meeting for approximately 70 minutes, a one-on-one meeting for approximately 35 minutes, and an expanded meeting as working dinner for approximately 45 minutes). i) The two leaders confirmed that works on realizing joint economic activities has reached a “new level”, and reached a shared view on the following points regarding the way forward. - Following the summit meeting, businessmen from both Japan and Russia taking part in the candidate projects will be promptly designated. - In July or August this year a “business mission” will be sent to the Four Islands. - Working-level staff will be instructed to accelerate work on realizing the projects promptly, including by holding vice-ministerial-level consultations based on outcomes of the “business mission,” and holding director-general-level working groups. 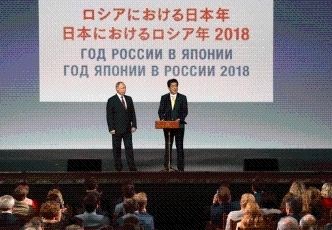 ii) Prime Minister Abe and President Putin confirmed progress with the five candidate projects designated by them, as both sides have agreed on many points concretely regarding those projects. (Note) (1) Project of propagation and aquaculture of marine products; (2) Greenhouse vegetable cultivation project; (3) Development of tours based on the islands’ features; (4) Introduction of wind-power generation; and (5) Garbage volume reduction measures. iii) The two leaders shared the view that considerations regarding a framework for movement of people which will contribute to smooth implementation of the candidate projects will be further accelerated. 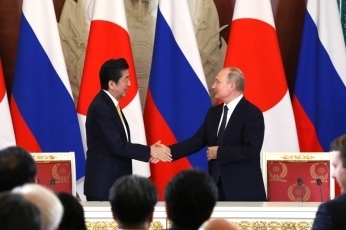 Based on the recognition that efforts by Japan and Russia are contributing greatly to build trust for the purpose of concluding a peace treaty and that it will be important to continue those efforts, the two leaders confirmed that a special grave visits by airplane will be implemented as early as July, weather permitting. i) Prime Minister Abe explained that Japan’s consistent position is to try to normalize diplomatic relations by comprehensively resolving the nuclear, missile and abductions issues in accordance with Japan- DPRK Pyongyang Declaration. President Putin expressed understanding. 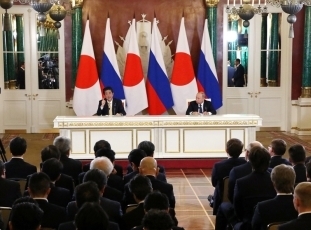 ii) Prime Minister Abe and President Putin confirmed Japan and Russia’s common position of pursuing the denuclearization of the Korean Peninsula. They also shared the view that they will support the holding of U.S.- North Korea Summit Meeting and will work to ensure that the summit meeting proceeds successfully. 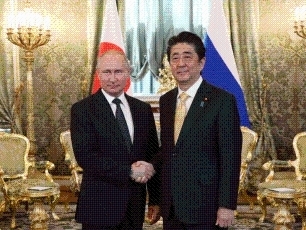 iii) Prime Minister Abe called for President Putin’s support and cooperation with promptly resolving the abductions issue, and obtained President Putin’s understanding. 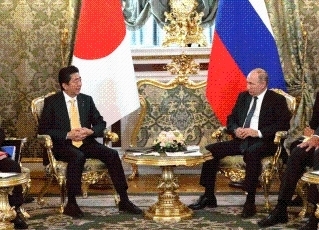 i) Political dialogue: The two leaders shared the view that a Japan-Russia “2+2” Ministerial Meeting will be held in the latter half of this year. They also agreed that they will meet again on the occasion of the Eastern Economic Forum in September in Vladivostok. ii) Responding to “non-traditional threats”: The two leaders newly confirmed the following three concrete outcomes. - Joint training by Japan and Russia for officers from Afghanistan will start in order to realize a drug detection dog training project. - The coverage of a training project for counter narcotic officers from Afghanistan and Central Asian countries will be expanded to management positions. - With regard to countering money-laundering, Japanese specialists will be dispatched to the relevant Russian organization this year. 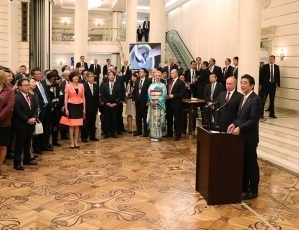 - Prime Minister Abe explained that more than 50 new private sector documents had been signed under the “Eight-point Cooperation Plan” since the summit meeting they held in September last year, giving rise to over 130 projects. The two leaders welcomed that economic cooperation is steadily being realized. 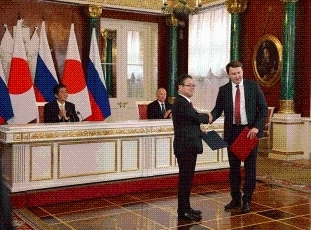 - The two leaders welcomed progress on the finance for supporting the Cooperation Plan, such as a joint investment framework established by the Japan Bank for International Cooperation (JBIC) and the Russian Direct Investment Fund (RDIF), and the signing of joint action plans on improving labor productivity and cooperation in the digital economy. 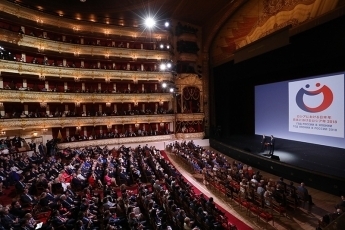 iv) Culture and exchanges: The two leaders welcomed the holding of the first ever “Japan Year in Russia” and “Russia Year in Japan”.